By Craig | November 12, 2018 | This post may contain affiliate links, which means we may receive a small commission, at no cost to you, if you make a purchase through a link. Read our Disclosure. Planning a trip to the USA and a trip to NYC with kids? I’m here to help. 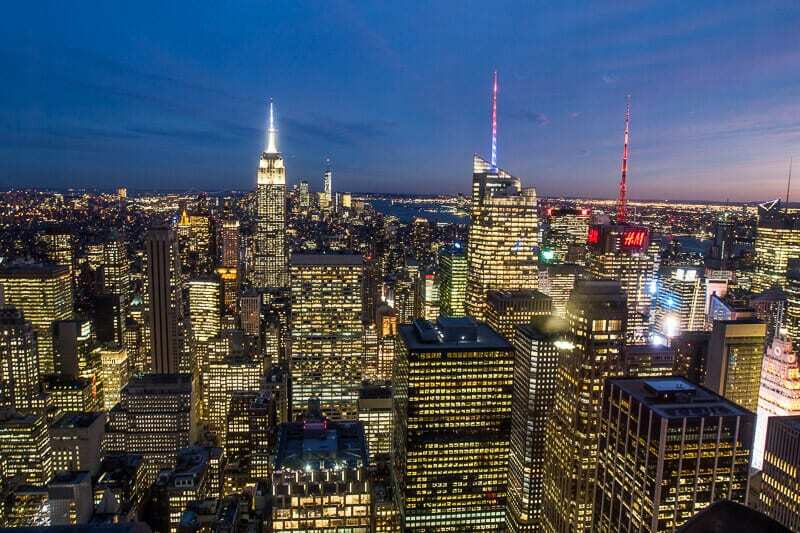 Deciding what to do in New York City can be overwhelming at first. There’s so many things to do in NYC with kids, and it feels like there’s never enough time. 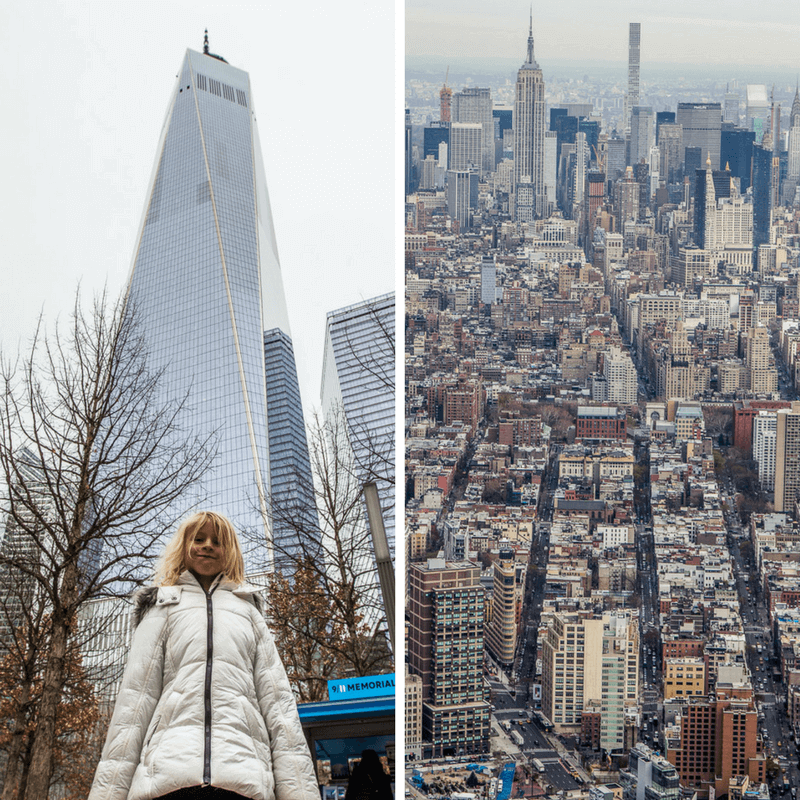 We spent two weeks visiting NYC in December with our kids, taking in the sights, the sounds, the food and the most popular New York attractions. But it still feels like we only scratched the surface. Whilst two weeks might seem like a long time, to be honest, I could spend a month in NY and not get bored, and I’m sure that goes for our daughters too! 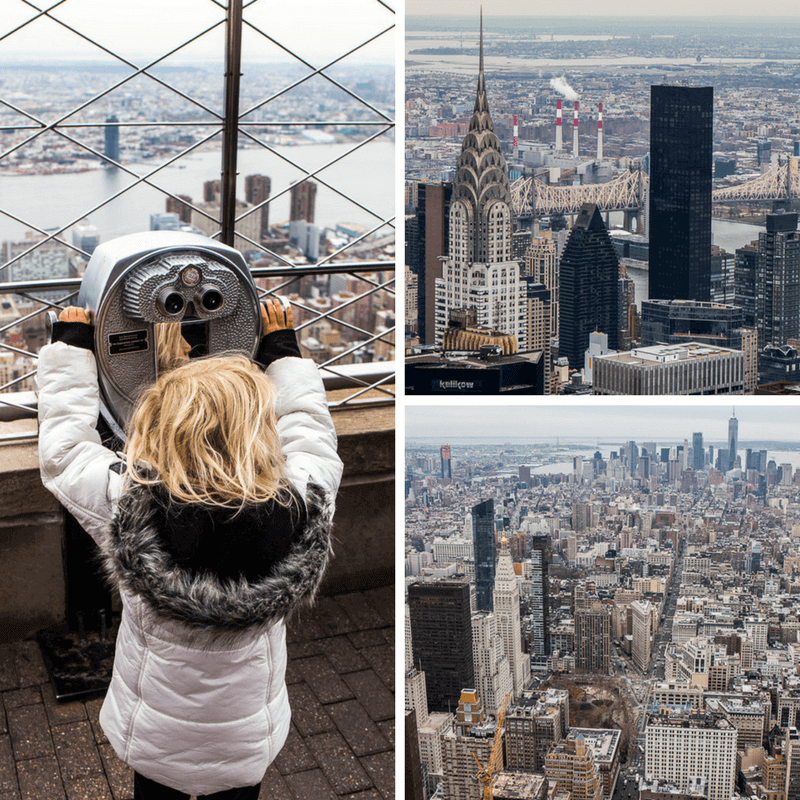 So if you only have a short period of time, down below I’ve listed our top suggestions for kid friendly things to do in NYC. 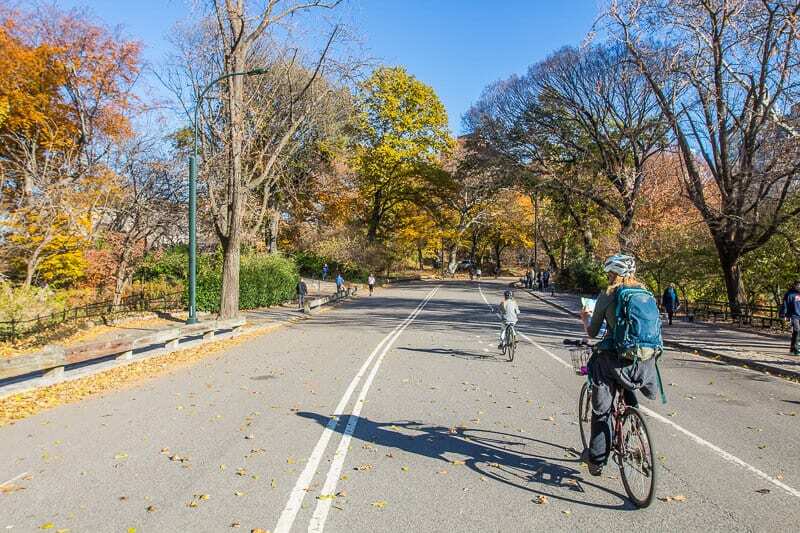 And if you decide to leave the kids at home, or have older teens you are comfortable allowing to explore themselves, all these activities in NYC can be done as a couple. Central Park is an incredible oasis in the middle of a concrete jungle. New Yorkers (and tourists) flock here to escape the crazy traffic and high paced life that is NYC. 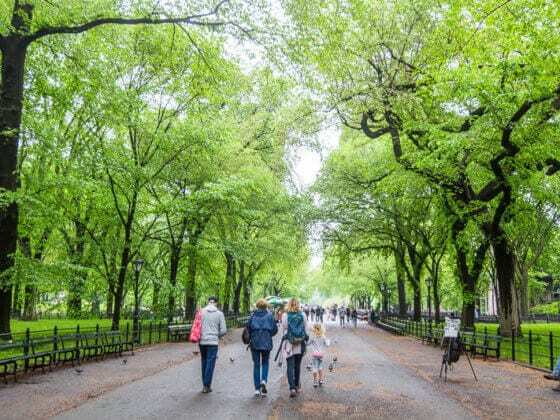 Stretching three avenues wide from 59th Street all the way up to 110th Street, it’s 840 acres of landscaped and recreational areas and 6% of the entire island of Manhattan. We explored Central Park in three different ways. On foot, by bicycle, and by horse & carriage ride. It’s the place to go to let your kids have space to run around in nature. We love riding bikes. Besides walking it’s our favorite way to explore a destination. It took us about an hour to do a full loop of the 6 mile path and that’s including a few stops along the way to take in the scenery and shoot some photos and video. The bike path is mostly flat and our kids did awesome, except for a hilly section at the northern end of Central Park. And it’s very safe, with a designated cycling path. There are cars but the speed limit is slow, and you just have to watch out for the horse and carriage rides. We had a tag-a-long bike for Savannah (6 years old) which attached to the back of my bike. So if you’re looking for fun things to do in NYC with kids, do this! Central Park Sightseeing have bikes for rent in various locations around NYC. They provide different options for the whole family, including helmets, baskets or bike bags, bike locks and a map of the park! 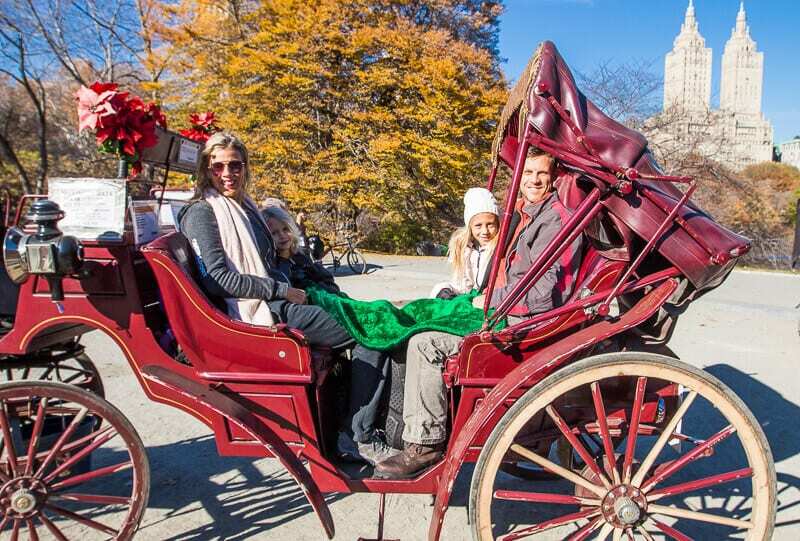 I don’t think there is a more relaxing way to explore Central Park than on a horse and carriage ride. We have always wanted to do this after seeing it in so many movies and TV shows – Central Park is one of the most filmed locations in the world. This is not just for couples, our kids loved it and we were all kept warm under a blanket. And the fall colors were an added bonus during our ride. 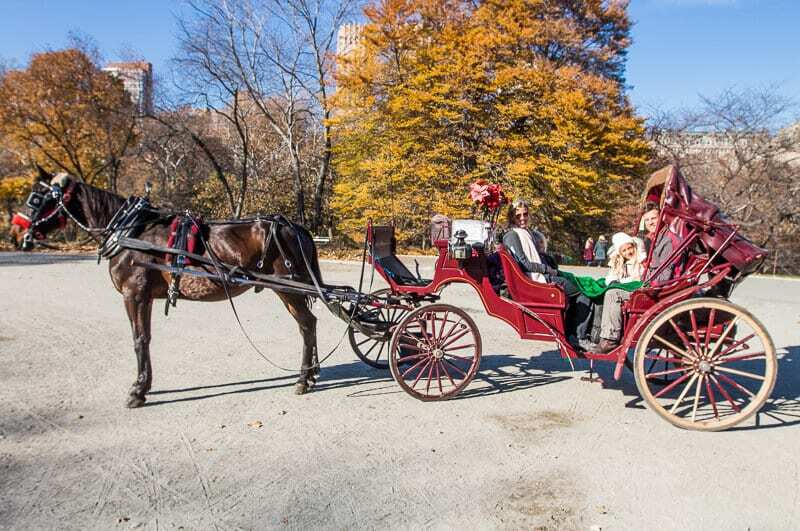 We rode with Central Park Sightseeing who offer 20 minute rides ($54 per carriage) or 45 minute rides ($118 per carriage). 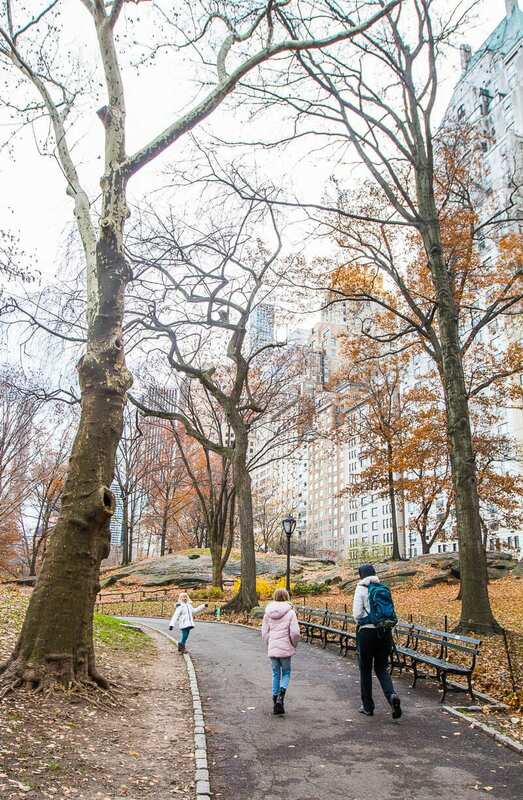 Of course you can explore Central Park for free on foot. It’s one of the best free things to do in NYC with kids. Grab a cheap map and just wonder. Walk down the Mall – lined with American elms and leads to the beautiful Bethesda Terrace. and for the super energetic there are 58 miles of hiking trails throughout the park. There are playgrounds for the kids to enjoy and of course there’s the Zoo. If you want to do a walking tour of Central Park check out this 2 hour walking tour and a sunset tour. This store is incredible. It’s every American Girl Doll owners dream. 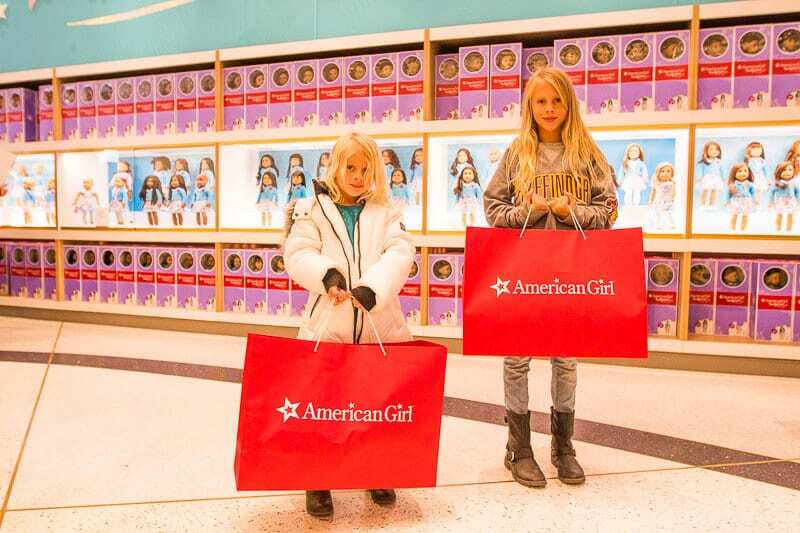 Our girls absolutely LOVE their American Girl dolls and if there’s one place we had been hearing about for months leading up to our trip to NYC, it was taking them to the American Girl Place Store in New York. We took them, and their dolls Coral and Lilliana to get their hair styled (there’s a salon) and to have lunch with their dolls in the cafe – we decided against this and that $20 kids meals were a bit much! 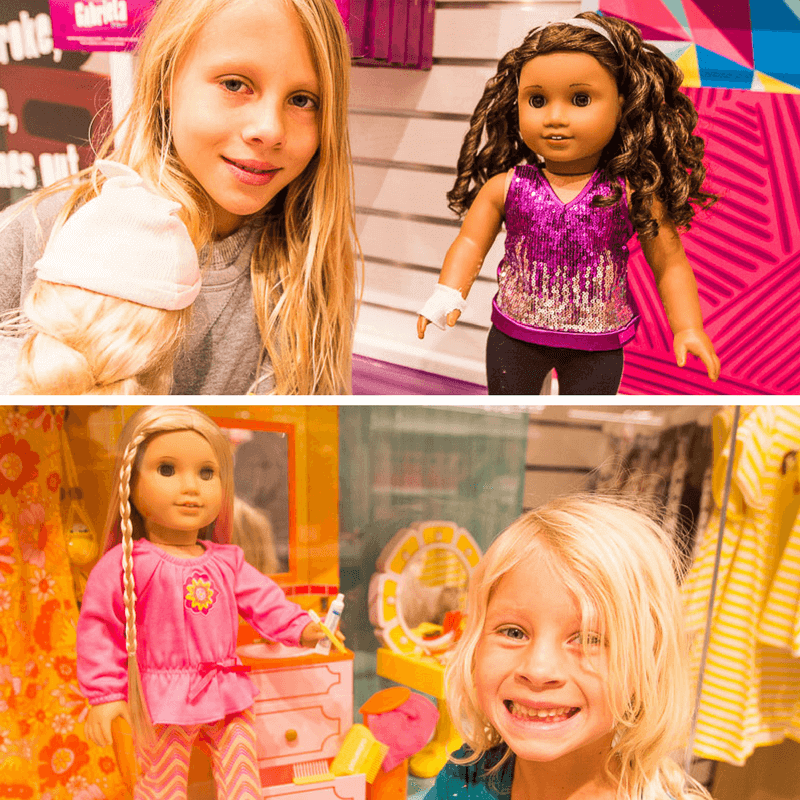 But they thoroughly enjoyed walking around the store checking out ALL the dolls and ALL the accessories. And thanks to Nanny and Poppy back in Australia, they each got to choose a new doll as an early Christmas present. 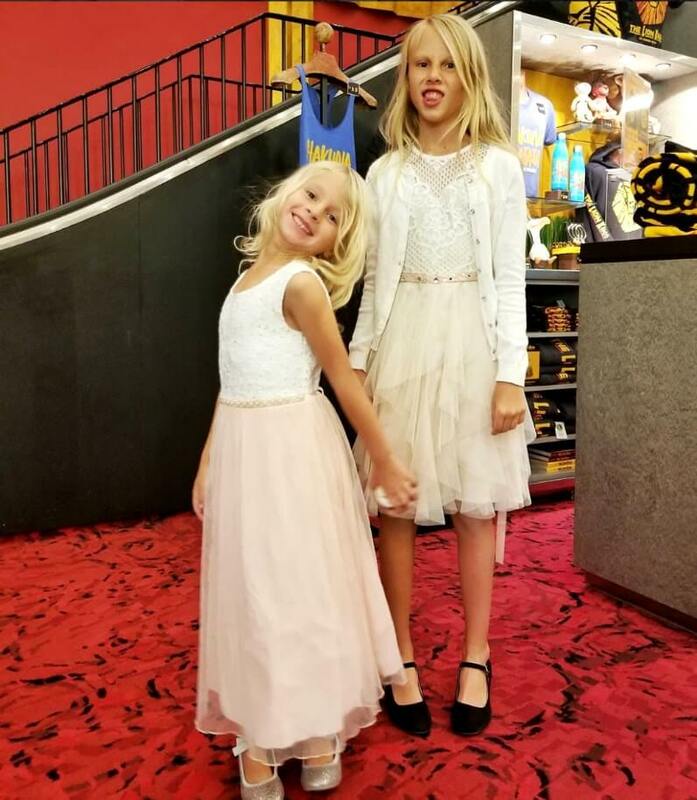 Kalyra chose Gabriela (doll of the year for 2017) and Savannah chose Julie. They now have two dolls each so we have four daughters now lol. It was so cool to stand at the top of the Empire State Building with our kids, an icon of New York City and one of the most famous buildings in the world. Many movie and TV scenes have been shot from up here, and the 360 degree views over Manhattan from the 86th floor are incredible. For different experiences, you can go up during the day, at sunset or in the evening. 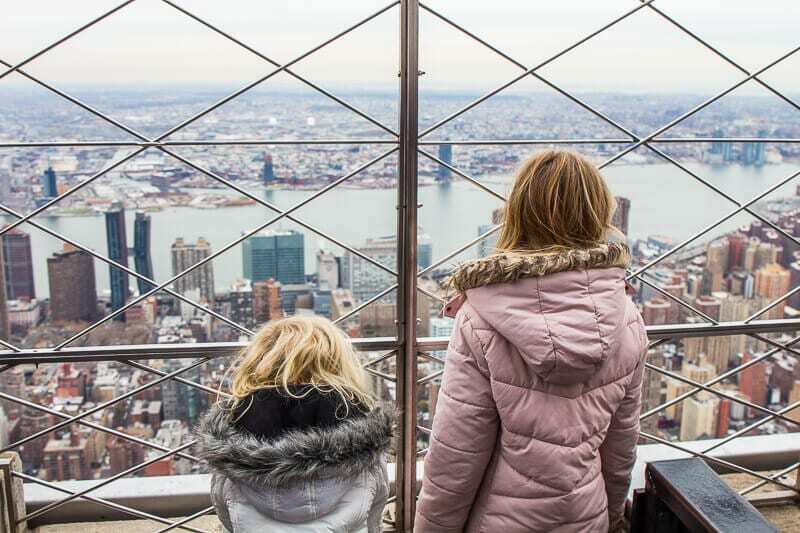 But like many attractions in NYC, the Empire State Building is very popular and requires some planning to avoid long wait times with kids, especially if you are on a tight schedule! To skip the ticket line and avoid queuing for hours, consider buying your tickets online. 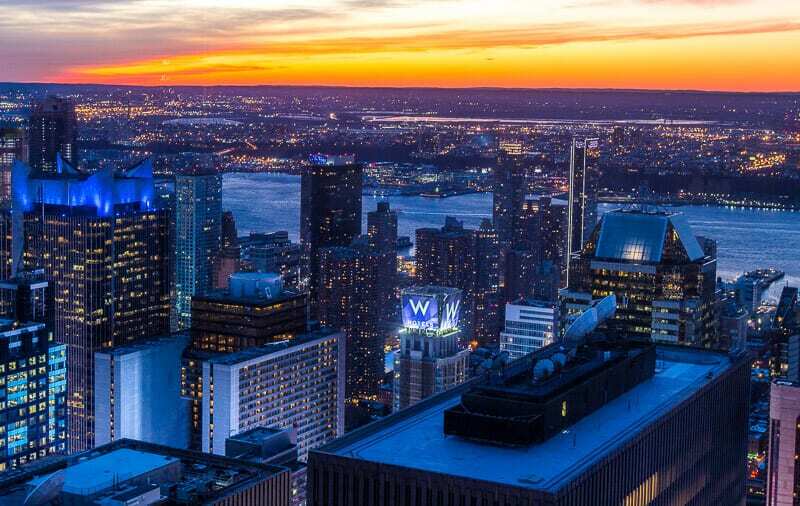 And for an extra special experience, consider the Express Pass with a 3-course dinner at STATE Grill and Bar (ranked 4.5 stars by TripAdvisor users), located on the Empire State Building’s first floor. One of the most fun things to do in NYC with kids. And unique for us as Australians – we couldn’t get our kids off the ice. 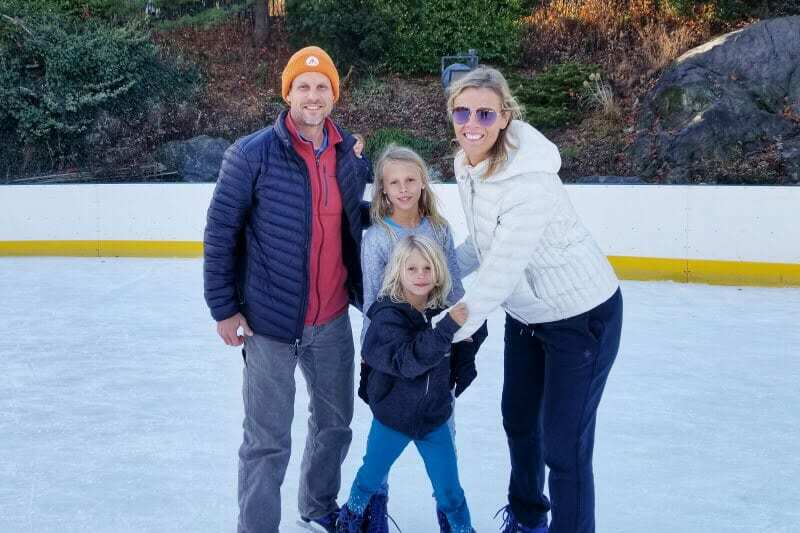 Caroline and I first went ice skating in NYC back in 2004 on Christmas Day in Central Park, which was magical, and we were excited for our kids to experience it too. 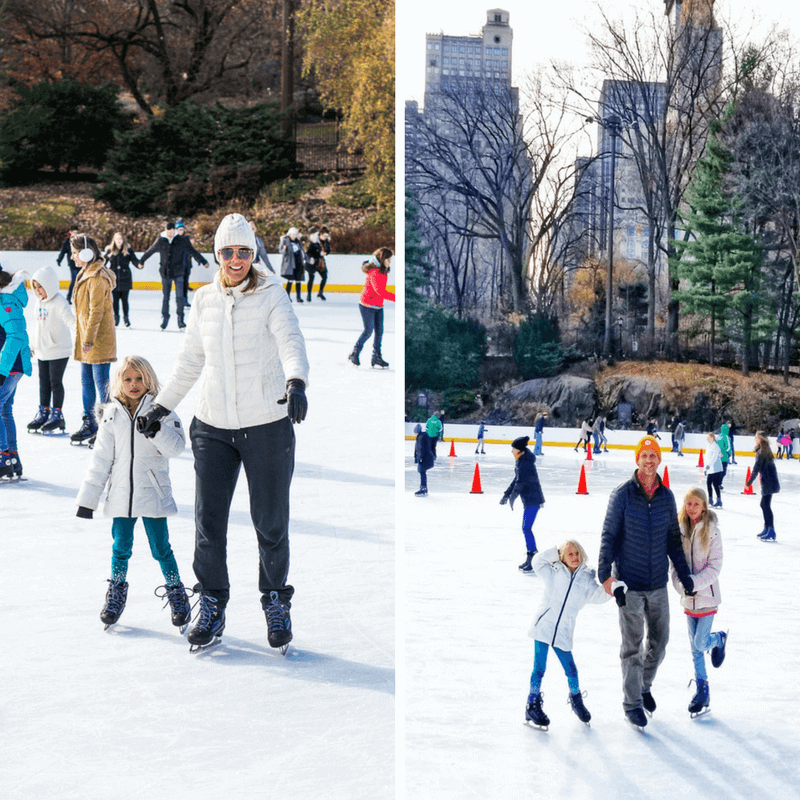 There are three options for ice skating; Bryant Park, the Wollman Rink in Central Park, and of course Rockefeller Plaza. 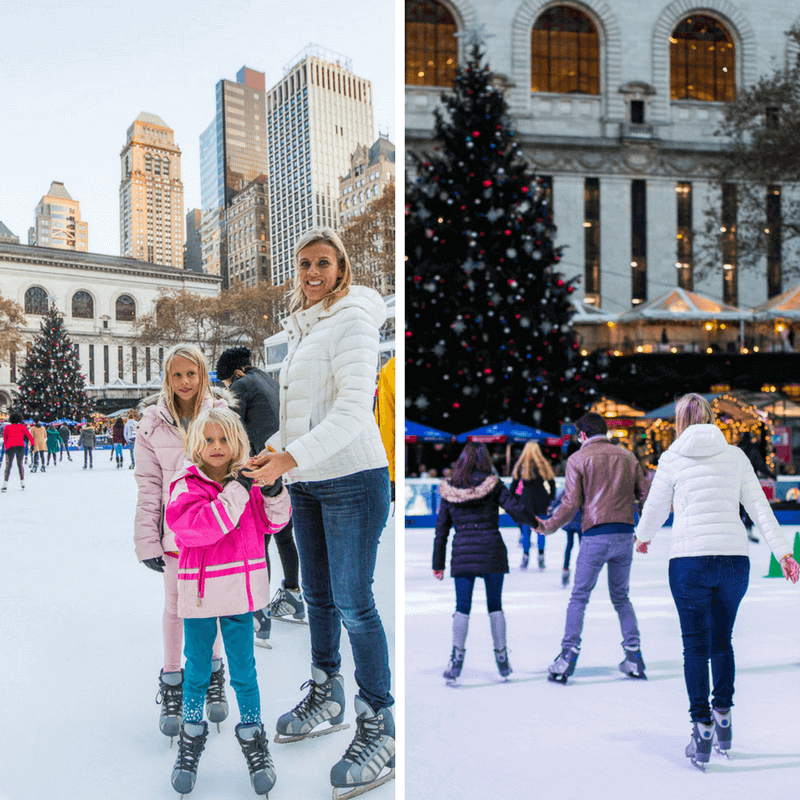 We got our skates on twice at Bryant Park and loved the whole Christmas in New York experience there. It was the first time ever ice skating for Savannah and at first she wouldn’t let go of the side barrier, but eventually she got up the nerve to go around holding Caz’s hand and then by herself. Kalyra was a bit of a natural and picked it up almost instantly. All up the girls went around for at least 2 hours. Get there before 6pm as in the evening it gets extremely busy when all the office workers finish work for the day! We also loved walking around the Christmas markets at Bryant Park. 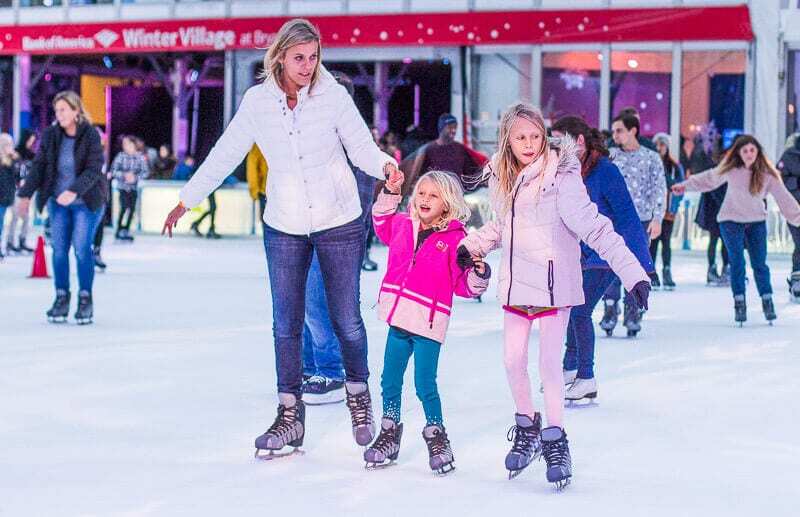 They call it “Winter Village at Bryant Park” which includes the skating rink, the pop-up shops, the Christmas tree and other festive attractions. It’s basically a winter wonderland in midtown Manhattan. They do great hot cider here! Oh, and close by is our fave Aussie coffee shop in NYC, Bluestone Lane, and our other fave coffee spot Culture Espresso. AND across the street from Bryant Park is Whole Foods Market where we grabbed lunch and dinner a few times and sat looking out the window over the park! Hours: Daily, 8am-10pm. Rink hours are weather permitting. Cost: $20 to rent skates. Admission free. 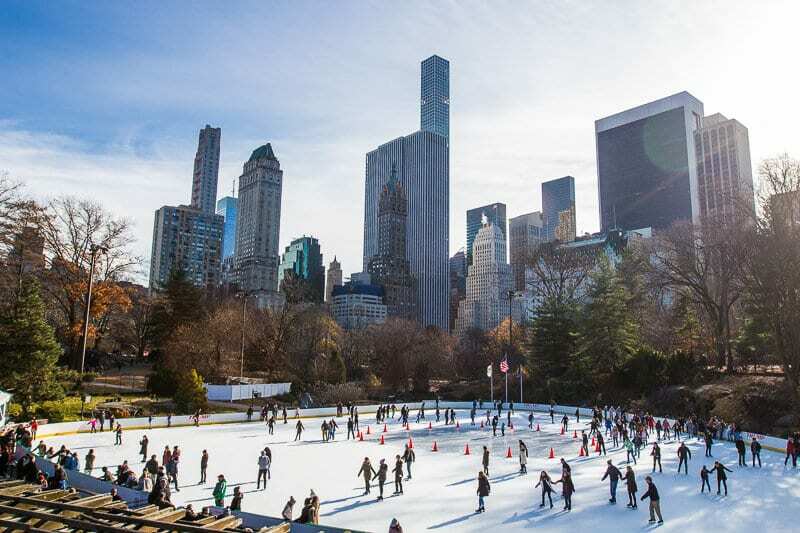 No doubt about it, the Wollman Rink in Central Park has the picture postcard background of the Manhattan skyline. On the day we skated here it wasn’t as crowded as Bryant Park, but remember to bring cash as they don’t take credit card – although there is an ATM on site. And of course Rockefeller Plaza is a famous and very popular place to go ice skating in NYC in the heart of midtown. We didn’t skate here. The rink is much smaller than the other two and I believe there was a wait time for general admission skating and you can also make a reservation. 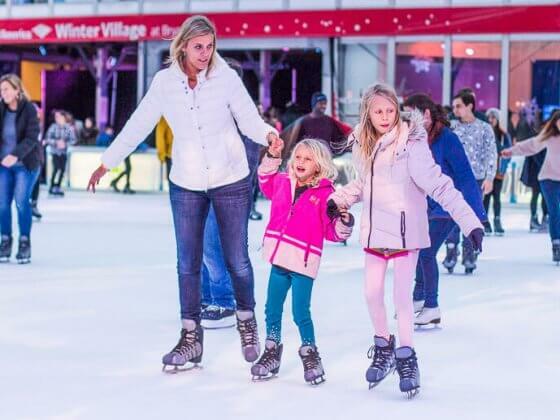 For us, our kids loved ice skating at Bryant Park and the Wollman Rink and they got better and better with each skate getting better and better at skating. We did prefer the overall experience at Bryant Park. The food and drinking options were better and the staff seemed friendlier and more professional. 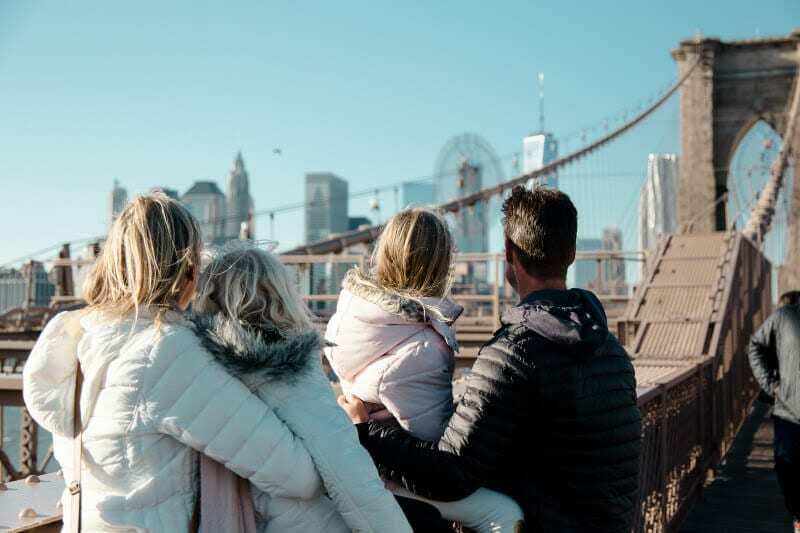 A stroll across the iconic Brooklyn Bridge is another one of the free things to do in NYC with kids. It’s one of New York’s most recognizable structures and connects the boroughs of Manhattan and Brooklyn, spanning the East River. There’s a designated pedestrian walking path, and cycling path, in the center of the bridge above the automobile lanes and more than 4,000 pedestrians and 3,100 cyclists cross the bridge each day. Access to the Brooklyn Bridge is 24 hours per day, with sunset being particularly nice and popular in the summer months. But anytime of the day is impressive with incredible views of Manhattan, Brooklyn, and the Manhattan Bridge. It can get chilly up there as you are more exposed to the elements so dress appropriately for the season you are in. 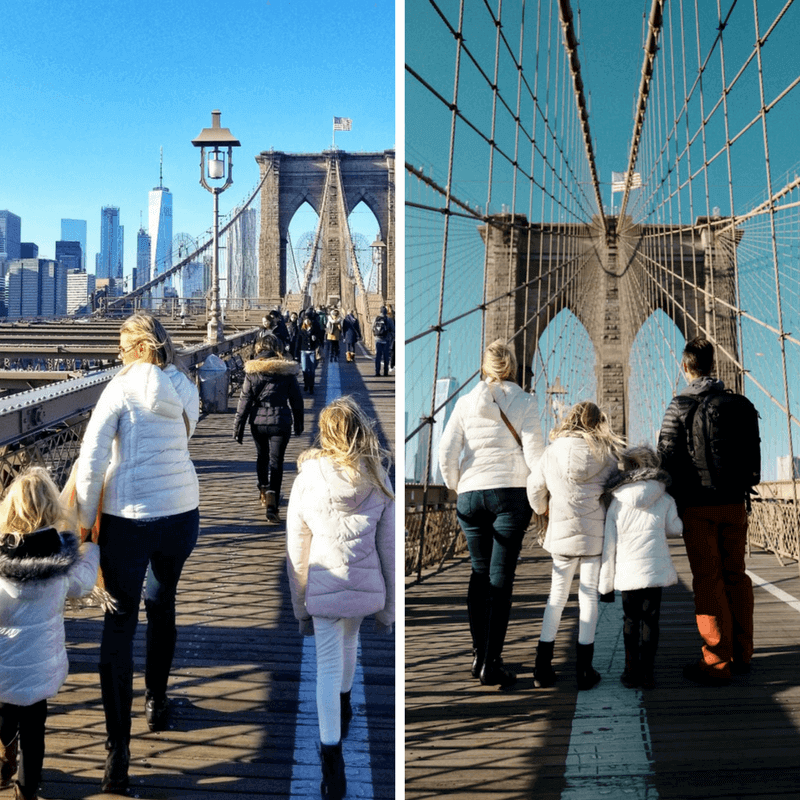 The Brooklyn Bridge is 1.3 miles (2.09 km) long so if you are walking at a casual pace with kids, and stopping to take photos, give yourself about 40 minutes. When you walk from Manhattan to Brooklyn you’ll end up in the DUMBO (Down Under the Manhattan Bridge Overpass) neighborhood. And get the iconic shot of Manhattan Bridge from the cobblestone intersection on Water Street. But if your kids are tired of walking, jump on the subway at the High Street station. Looking for things to do with kids in NYC that involve a mummy and daughter date night? It doesn’t get much better than a date night out at the theater, on Broadway, to see the Lion King. The Lion King had been on our bucket list forever and it did not disappoint. Caz and the girls loved the show and loved getting dressed up for it. A must do in NYC! Always best to book ahead for popular shows, but if you want the opportunity to get up to 50% off same day tickets, check out the TKTS booth in Times Square, Seaport or Brooklyn. The NYC sightseeing Pass now includes a $40 attraction credit for certain broadway shows including Wicked, which we saw with my parents and LOVED! Get yours here. 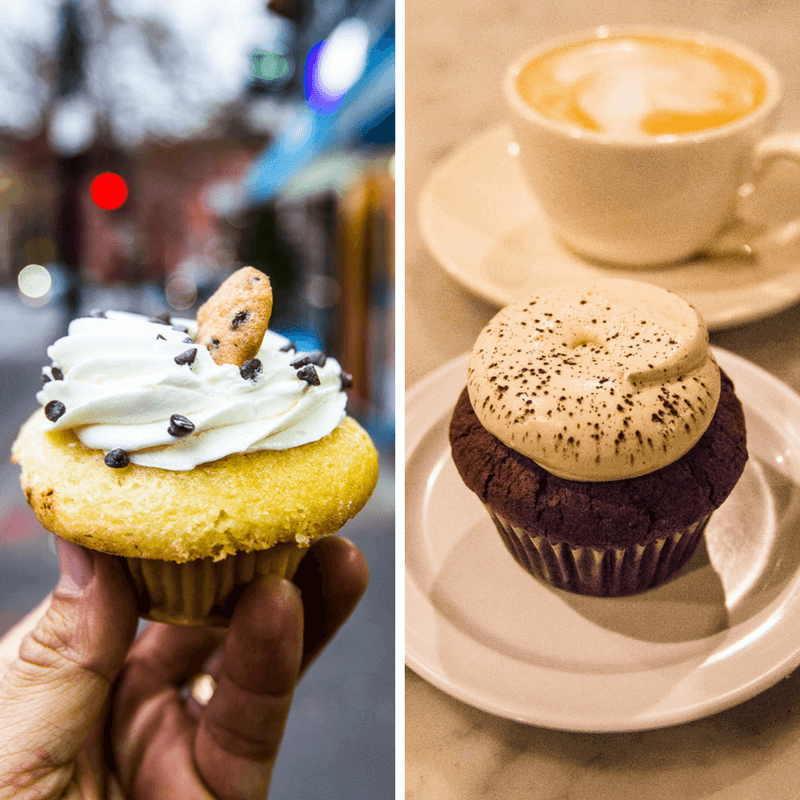 We never knew cupcakes were such a big thing in NYC. Turns out they take their cupcakes very seriously in NY, and many of the well known stores, like Magnolia’s, have lines out onto the sidewalk. We didn’t fancy waiting outside in the cold, maybe next time when we revisit in warmer months, and only tried one cup cake store so the kids could get their fix. We popped into Molly’s Cupcakes in Greenwich Village which was cute with a nice selection (my photo above is called cookie monster) and they have a cool counter with swings you can sit at. And their story is sweet (pardon the pun). Molly was the founders third-grade teacher, and whenever one of them had a birthday, she would bake cupcakes. So in honor of Molly and as a way to help the children, a portion of their profits is donated directly to schools in their community. Nice touch! 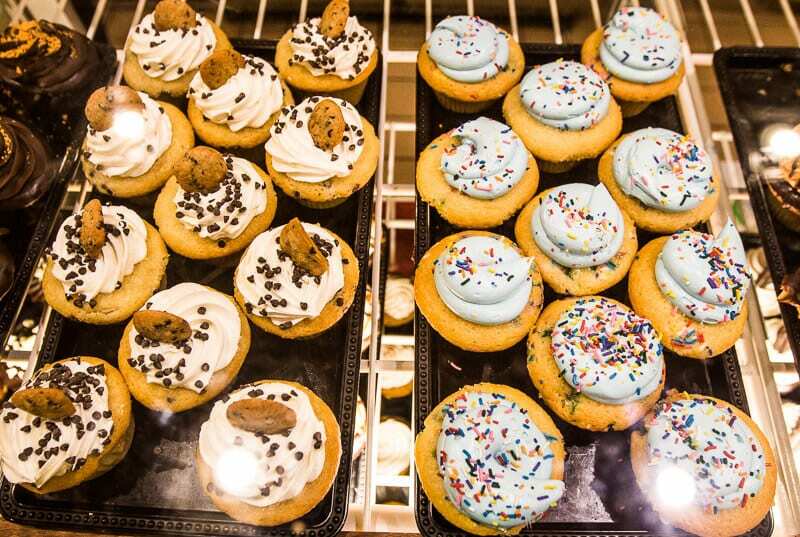 Put this on your fun activities in NYC list, well, for your kids tummies! 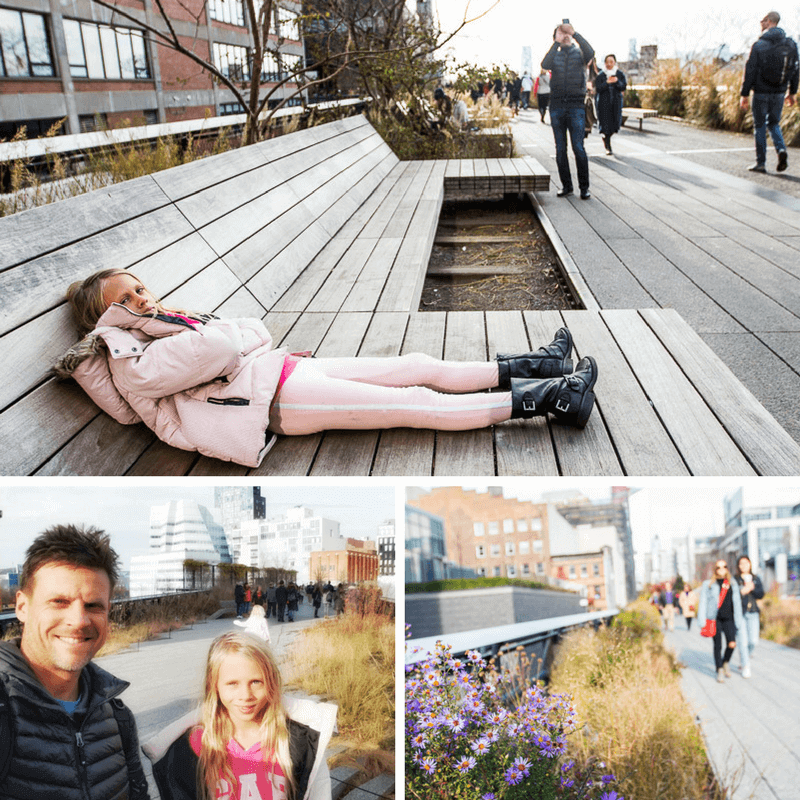 One of the most popular free things to do in NYC with kids is to walk The High Line in Chelsea. What a great concept this is. 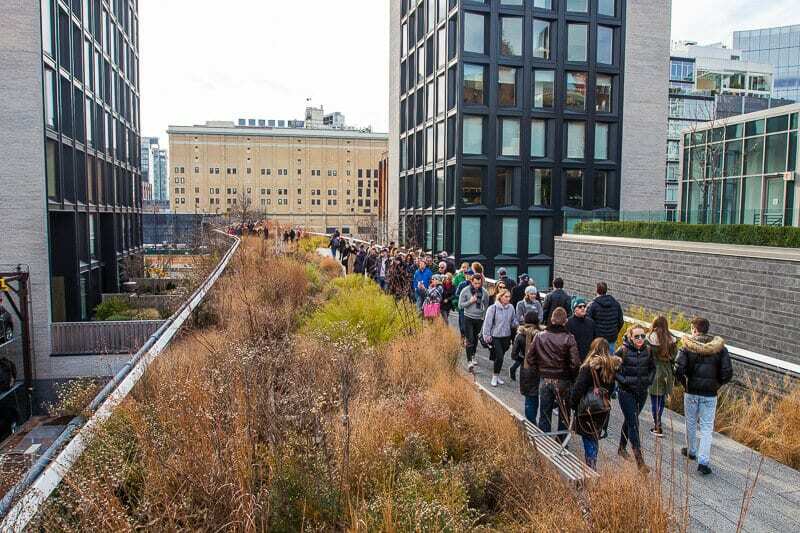 They turned an old elevated train line into a pedestrian walkway spanning 20 blocks – it’s a nice way to escape the busy traffic on the streets below, and there’s some cool architecture and street views along the way. When we did this walk in December it wasn’t as colorful as it would be in the spring, and a word of warning if you do it on a weekend like us, it can get crazy busy – consider doing it on a weekday! There’s plenty of seating along The Highline and apparently during summer there’s weekly free drop-in workshops for kids. For a bite to eat along the way check out the popular Artichoke Pizza for one of the best slices in NYC (be prepared to wait) or the Chelsea Markets (very busy on weekends also). But we enjoyed the cool and cozy atmosphere for lunch at the nearby Grey Dog on W 16th Street. 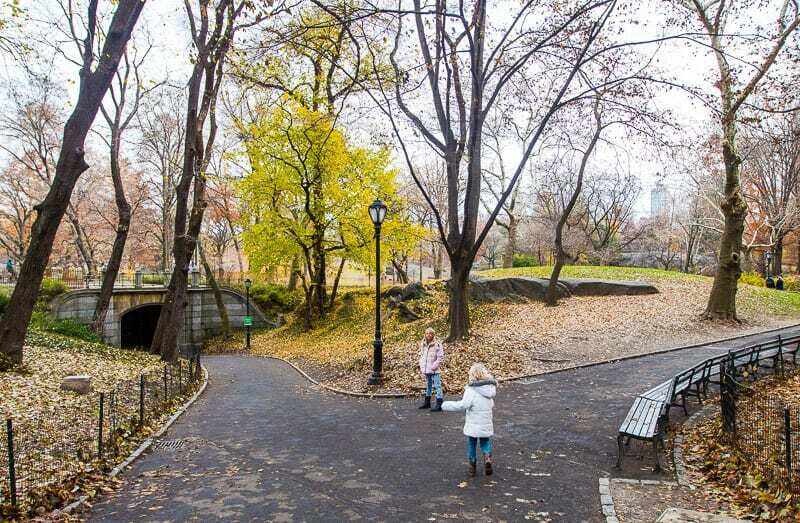 Our kids are generally good walkers and love to burn off their energy, and this walk is a must do in NYC. It can take 30 minutes, or an hour or more. If you visit NYC during Christmas time, one of the festive things to do is see the Christmas Lights on the exterior of Saks 5th Ave.
Just don’t do what we did and attempt to see this on a Saturday night – the crowd was insane – so avoid the weekends if you can. The light display is on every 10 minutes and runs for about 4-5 minutes and gets you in the Christmas spirit. Great for the kids to see! Again, avoid this on a weekend night if possible, and if you attempt to see it on opening night like us, good luck and go super early or you will miss out like we did – one of the craziest crowd scenes I’ve been a part of. 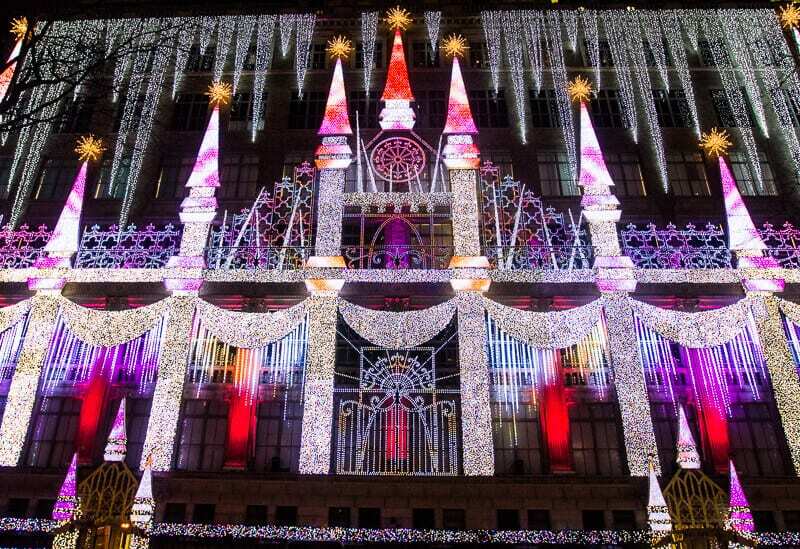 But we finally got close enough on the same night we saw the lights at Saks 5th Ave, and it’s definitely pretty. You can’t visit NYC and not see the Manhattan skyline from above at night time. It’s one of the coolest things to do in NYC at night. The Top of the Rock (Rockefeller Building) is located nicely between the Empire State Building and Central Park, and the 70th floor offers an excellent perspective on both. I suggest going up an hour before sunset so you get to see Central Park in daylight, then see the beautiful sunset over the Hudson River and the lights come on in the city. Just make sure you book your ticket in advance to avoid the ticket lines as it’s very popular, especially at sunset. I almost missed sunset as I booked my time for 45 minutes prior to sundown and it takes a while to get through security and through the lines to the elevator. I would book your time for 90 minutes prior to sunset. 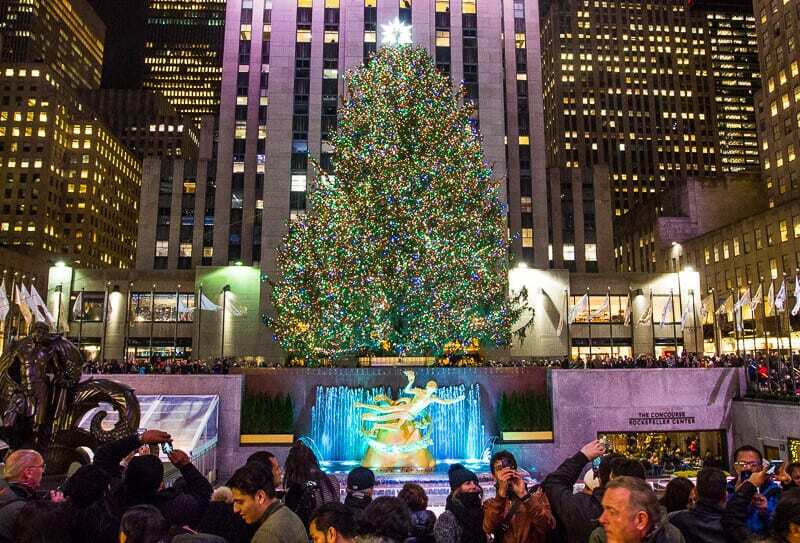 And remember, if you visit New York during Christmas time you can hit the ice skating rink, plus place a wish under the famous Christmas tree. As much as we love exploring a city on foot, and New York is very walk friendly and easy to navigate with its grid system, you can’t walk everywhere with young kids, especially if you are there in winter, or the opposite and it’s super hot. We bought a weekly pass for $32. Luckily Savannah was still free. Basically, if your kid can fit under the turnstile they are free. So for us it was 3 x $32 for unlimited rides for seven days. And used the subway app on our phone. 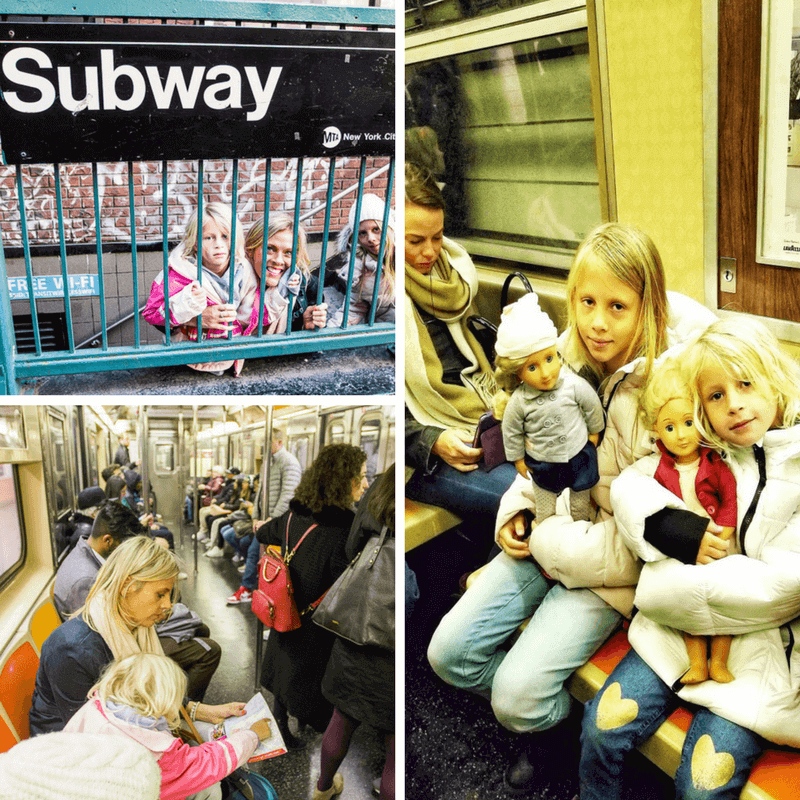 Our kids had fun and we love to travel like the locals, see a city from their eyes, and you can be sure there is no lack of entertainment on a NY subway train. Book a hotel that’s within easy reach of a subway station and you can be anywhere in NYC in no time. We had a subway stop right near our Innside New York Hotel in Chelsea and could walk to Penn Station which was a super practical location for either taking the subway or walking. Flashing lights, streaming news, gigantic billboard ads, and a mixture of locals and visitors from all corners of the globe…it is the “crossroads of the world”. 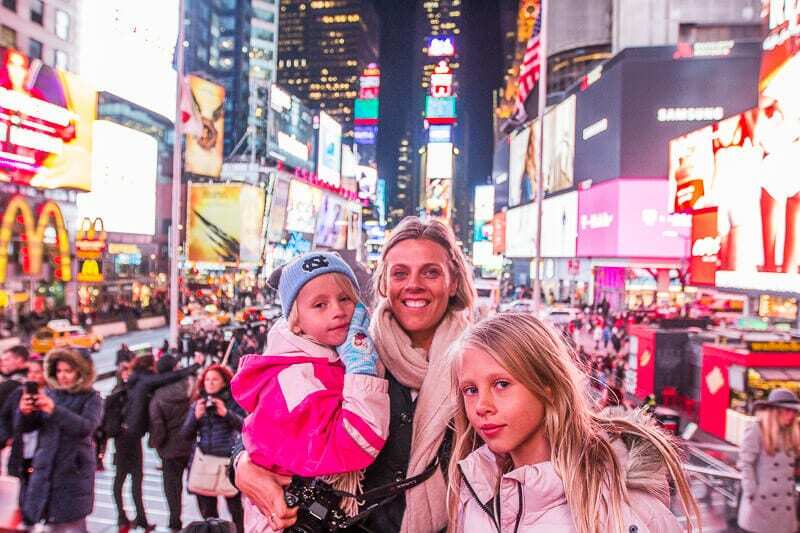 Every visitor should visit Times Square once. But, prepare your kids for heavy crowds, traffic congestion, and costumed characters who are happy to pose with you for photos, but they expect to be paid. Oh, if you do stick around to grab a bite to eat here, we enjoyed Hard Rock Cafe which is never our first choice but pretty good for a chain as far as quality and price goes. Many of our blog readers and followers on Facebook suggested going on The Ride. So we did. And what fun we had. This is definitely one of the most unique things to do in NYC with kids. Just picture a multi-million dollar bus with theater style seats facing sideways towards the sidewalk with street performers entertaining you as you drive around the city. The ad libbing rapper was sensational. 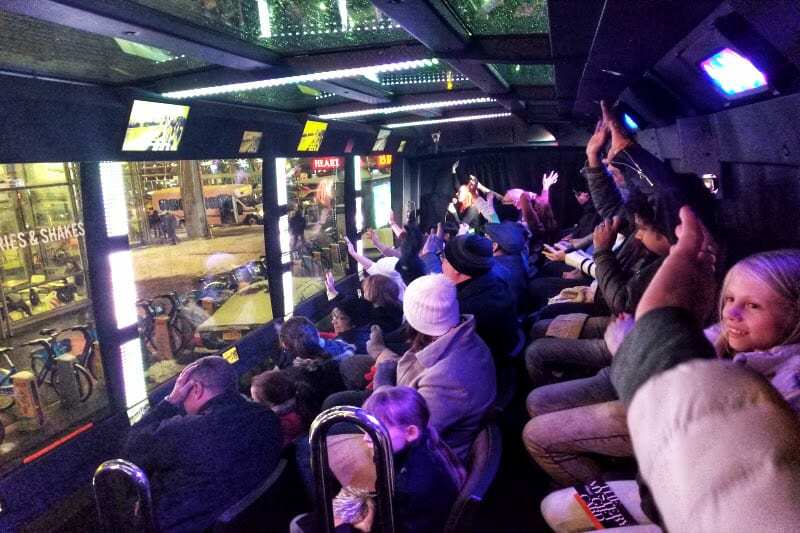 The Ride is included in the New York Sightseeing Pass or you can grab a ticket direct here. As it was included in our Sightseeing pass I thought it was great value. I’m not too sure if I would have paid for it otherwise. 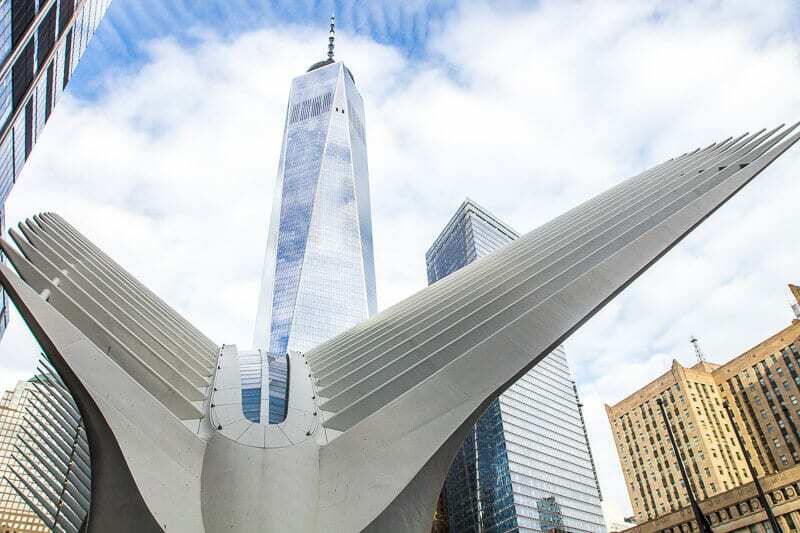 We spent most of the day visiting the One World Observatory (or Freedom Tower), the 911 Memorial and Museum, and The Oculus – which is extraordinary in its design, symbolism, and remembrance. So many emotions went through our minds when we visited the site of the September 11 terrorist attacks in NYC. The top of the new One World Observatory is the highest view point in New York City and offers spectacular 360 degree views all over Manhattan and beyond. I won’t spoil the surprise for you, but be prepared to be wowed when you first enter the viewing floor and are shown a short movie. 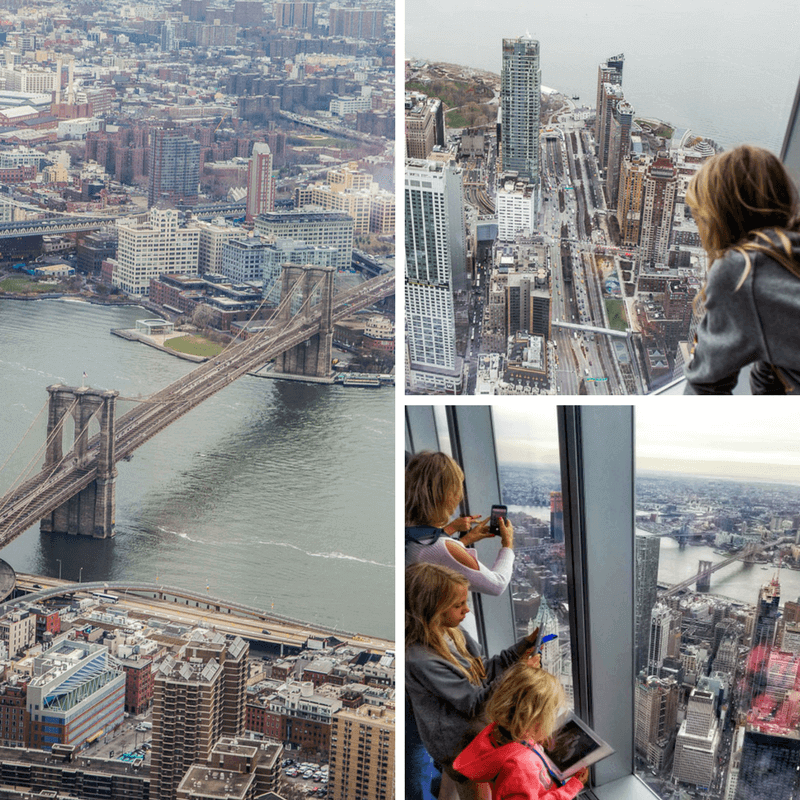 Our kids enjoyed arriving at the top via Sky Pod elevators (climb 102 stories in 47 seconds) whilst it reveals the transformation of New York City. They also loved using the interactive ipad (One World Explorer). 40 of New York’s most interesting sights are highlighted for video content, including a section of special interest to kids. This is one of the must visit NYC attractions and the entrance fee is included with the New York Sightseeing Pass. Or you can buy an individual skip the line ticket. And we are not big museum people, so for tips on museums and even more things to do in New York City with kids see this post. Doing a NYC tour can be a fun and convenient way to explore the city, especially if you don’t have much time. Having an experienced and knowledgeable guide can make it fun and interesting for your kids too. Booking.com has over 1,000 properties in NYC. You get free cancellation on most rooms and a best price guarantee. Check out our post on the 5 best properties from budget to luxury. You can look for your perfect Airbnb rental here. Don’t travel without it! We’re ambassadors for Allianz Travel. In the US, kids travel for free! Click here for more. Australian readers, use the code YTRAVEL online or over the phone for up to 10% discount. We loved our time in NYC. After looking through your list though we need to head back. So much more to see & do! 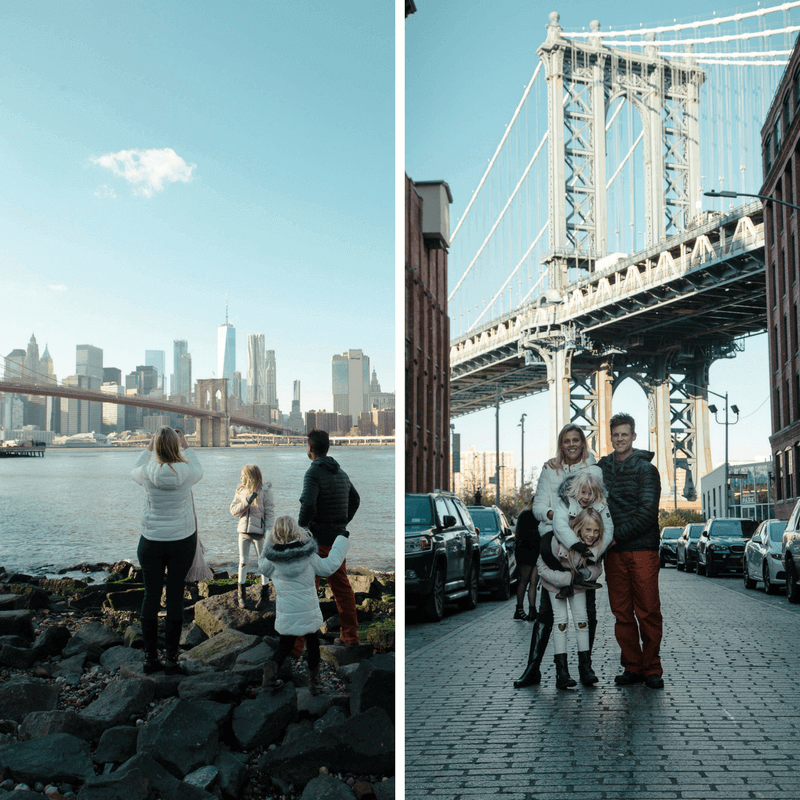 We don’t have kids, but we still love to do nearly all the activities on your list 🙂 NYC is such a great city with so much to see and do – everytime we visit we find we just don’t have enough time to see and do everything we want! 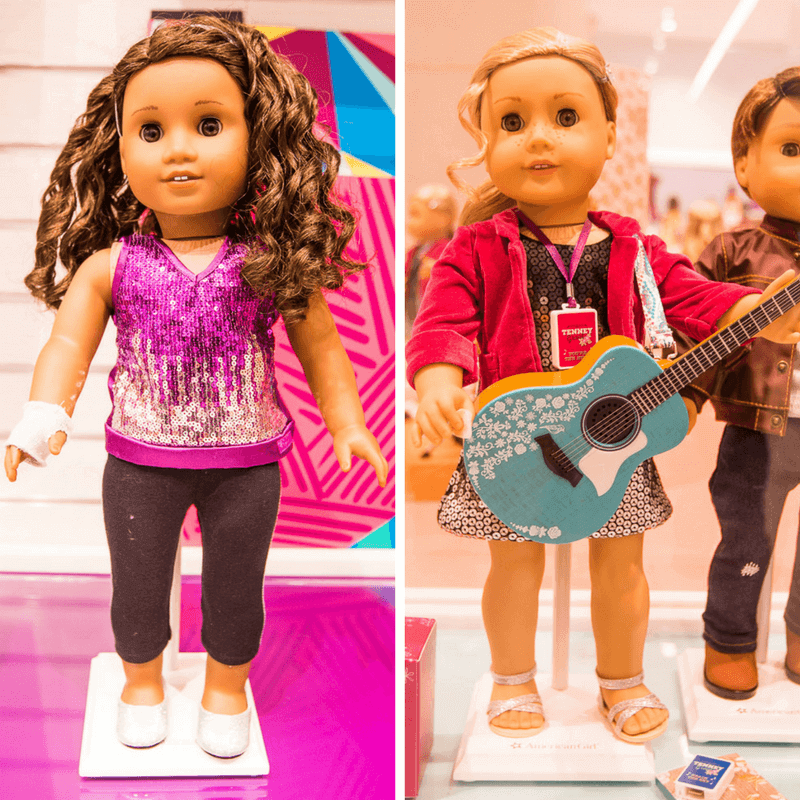 Haha yes, that American Girl Doll store is definitely for a specific age, but like you said all the other attractions are a must do in NYC for first timers and are suitable for those with our without kids! Consider yourself adopted. But you will have some child minding duties!! She’s dropped Musically. Realised it was time consuming and fake. Thank Goodness. This post is brilliant! I was scrolling on Pinterest and found your post and couldn’t be happier that I found it. I live fairly close to NYC and have not seen early as much as I need to. Thank you so much for posting this informative post. Glad you found the post on Pinterest. Yep, lots of cool things to do in NYC with kids or even without. We could spend weeks there and not get bored. Enjoy exploring more of New York! Awesome post! Really helped me plan our family trip to New York City this summer. We are planning to go to NYC during this Christmas season and this post helps a lot !! I also have two kids and many of your list would be great places to explore. Thanks a lot ! !